Mud stains on clothing are a common occurrence. If not treated properly they can be difficult to remove. This is a guide about removing mud stains from clothing. My dd received a white shirt from her grandmother, (big mistake for a 5 year old) and she played in a mud puddle while wearing it. I have soaked it in hot soapy bleach water with vinegar and baking soda, and cannot get it white again. Any suggestions on how i can get these stains out? I even tried soaking it in hot soapy water with lemon juice and hanging on line. Please Help! Thank you in advance! If it's plain white, squirt it with X-14 or whatever strong bathroom cleaner you use and wash after 30 min. or so. I restored white canvas tennies that had been worn in the river this way. If you leave it on 3 or 4 days, it will make a hole; don't ask how I know. try boiling it in a 2 quart pan with lemon juice and 2 T cream of tartar. You could also try this. Works great on whites. Add one cup of powdered Cascade and Clorox II to five gallons of the hottest water you can draw from your tap. Soak items overnight and launder as usual. Make it tie dye like a hippie! Everyone can be happy. I have a light yellow pair of linen and cotton pants that mud splashed up on the back. I first washed as normal, then tried putting a paste of oxi clean on spots, then tried oxi clean and Shout together. I have not put them in the dryer any time. Mud spots are lighter but still there. What else can I try? Classic Coke or white vinegar, I would use Classic Coke first. Also, white cheap toothpaste works too. Good luck. If you can get Sards Wonder Soap in America, I would try that. It is all I use for stains and it always works. I buy the cake of soap which is cheaper than the other forms of Sards, and it lasts a long time. Hope this helps. The best stain remover I've ever used is one cup of Calgon and one cup of all fabric bleach in a five-gallon bucket with the hottest tap water you can rustle up. Soak overnight. Gets almost everything out! See if you can find a rust remover that can be used on colored clothes. I've always used Super Iron Out or one that comes in a brown bottle (can't think of the name and it's the one I prefer because it works on contact, but I don't think it's recommended for colored clothes). Walmart has both of them. How do you get clay mud out of white baseball pants? The care tag says "Do not use bleach". Hand cleaner at dollar store one dollar it comes in a small tub its like a gel type thick paste clear in color. It's the same thing mechanics use to put on their hands first to loosen grease then wash off. It is the best for the job. Take your item put some hand cleaner on an old tooth brush scrub it in good all fabric fibers both sides. Let set for about an hour then put it in the wash using warm water add some laundry detergent too let agitate in the wash for about 30 minutes then wash load as usual. Add a tablespoon of it to any wash to make clothes brighter. 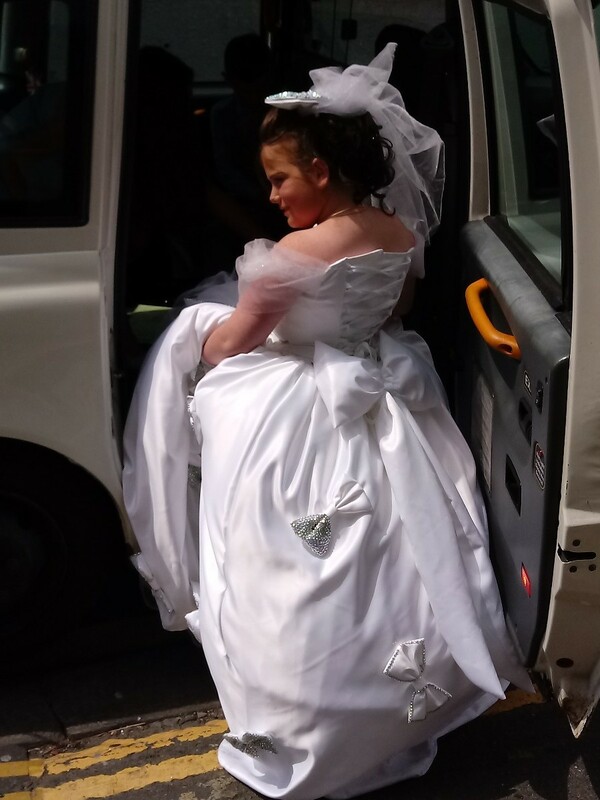 My daughter's white wedding dress bottom had red clay mud stains set in after 3 washes nothing helped. I tried this method I am suggesting now, that someone suggested to me and it worked. If you get a stain on anything, apply it right and wash item. It works. Iron Out, it is found in the plumbing section of the grocery store. I used it all the time when my son played ball, because we have "red clay" here in Alabama. I've got a stain on a holy communion dress on the back. Some black dirt from the wheels of a car has gotten on to it. How can I remove it or is it better to go to a dry cleaners? 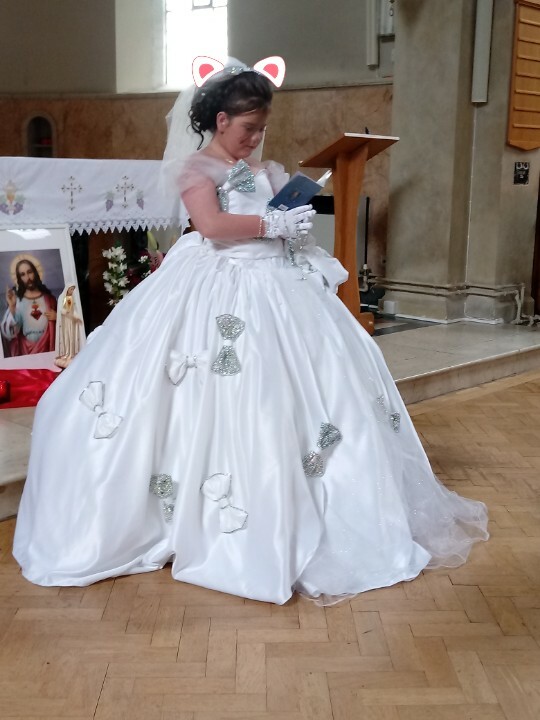 That is a gorgeous communion dress. Since it's beautiful and looks very expensive - I would take it to a professional. I'd check Yelp and check out local dry cleaners to see which would be best and maybe call for a quote. What is the material? Its pretty -- I would take it to a cleaner to be safe. 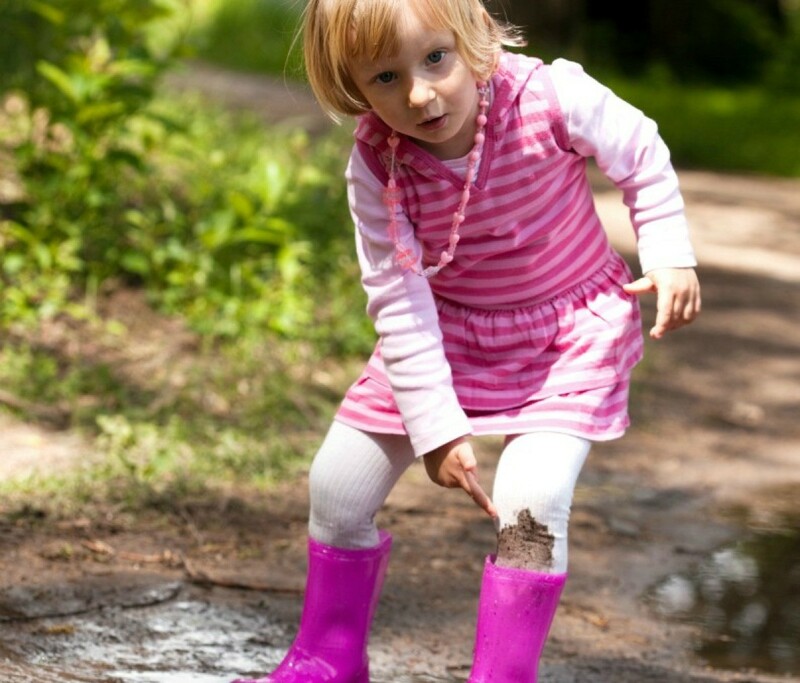 How do I clean my son's ground-in construction dirt and orange mud? I've tried several things, from soaking with Dawn detergent overnight, to pre-treating with Shout It Out, but nothing is cleaning his ground-in dirt and orange mud stains from his jeans. Any recommendations? What are people using to pre-treat after soaking and before washing? Is there a specific laundry detergent for this purpose? First thing to try is to be sure you have as much caked or loose dirt/mud removed (outside) as possible. If you have a long table outside you can lay them out, wet and use a large brush to remove as much as possible before placing in the washer. You will not want to do this everyday so finding a good solution for your washer will be necessary. I have always liked adding washing soda to my laundry with a stronger detergent (Tide, Wisk) and wash in warm water and never overload the washer. If drying is necessary, partially dry outside and then dry on fluff (no heat) - this works and will not set stains. Finish drying in laundry room if necessary. Mean Green - Lestol - washing soda and a good splash of Simple Green - 1 cup of ammonia to wash along with detergent. Check out these suggestions from past questions. I went mudding and my hoodie obviously got covered. We were in a hurry when we did the laundry and forgot to treat it. So we washed it and then dried it. Then I saw the mud stains. I am using rubbing alcohol along with shampoo mixed with water and it is slowly getting it out as I scrub, but it is taking forever! It's a neon yellow hoodie like Penndot color. Please help. An enzyme detergent might be the answer. Soak the hoodie in a strong solution, leaving overnight. Rinse well and check. Another treatment would be oxygen bleach powder which will not affect the colour. Use Lestoil or Tide. These detergents are meant for heavily soiled clothes. My two sons had a football game in a foot of mud. Needless to say I have soaked their blue and white jerseys in just about everything. Is there anyone with a helpful hint that can get the dirtiest, all over mud stain clean? Try carpet cleaner and rinse well. Simple Green - found in cleaning and/or automotive section of most stores. Spray directly & let sit, or pour into bucket with water & let soak if it's over a large area. Sometimes you have to scrub with a toothbrush & repeat application, but it cleans most stuff. Clear Magic might work also. I wore my brand new white jeans with flip flops on a rainy day to the city. Needless to say, I got dirty marks all over the back of my pants. I sprayed with Oxiclean, let sit overnight and washed them the next day. The stains did not come out. I have had them soaking in bleach since yesterday and I can still see the marks. Is there anyway to save these pants? I don't have a solution, I think the reason the spots won't come completely out is because there is a possibility that there was automotive oil that had leaked out of cars, mixed in with the water. I used to have that problem too, whenever I wore any light colored pants to church and had to walk across the church parking lot, after it had rained just a little bit, it seemed like there was always just enough moisture on the concrete, that it splattered up on my pants, even though I was wearing high heels. I was out side with my teacher; we were looking for rocks and I decided to stay at the first creek we passed. Any way, I was seperated from them, and then I saw this one boy climb up a rocky path across the pond, and assumed that he was going to the rest of the group. Anyway there was a sand bar between me and the path, and I decided to walk across it, then I sunk into the mud, it came up to about half way up my shin. I was wearing my paranorman foamposites and didn't want them to get dirty, so I put them in my book bag, and borrowed a pair of boots from my teacher. In a rush, I had forgotten to take off my coat. It was a black and white Jack Skelington coat from Hot Topics, the torso was black with his face on it, and the arms were white, and now its covered with what's either dirt or clay. Any way to get it out? And as far as answers go, sooner would be better than later please. How do I get ground in dirt out of school shirts? Ok, long story. I made an awesome Halloween costume for my youngest child, that's made of white and black cotton. It rained pretty heavy on Halloween night, but he insisted on going trick or treating, so I took him. Unfortunately during his run, he got the bottom of his pants, completely soaked in rainy muddy water and dirt. It was my husband's job, when we returned, to hurry and try to wash the pants. He didn't and instead, stuffed the muddy outfit into a plastic bag, and hid it in the back of the laundry room. I just ran across it late last night. So far, I have it soaking in Oxiclean and cold water. It's been soaking over night, but I can still see tons of the mud. Is there a sure fire method to returning the white parts of these pants back white? I have a pair of white polyester, rayon and spandex dress pants. They have a set-in mud stain that I cannot get out. I have tried numerous things, but the mud stains will not come out. Unfortunately the pants went through the washer and dryer before realizing the stains where there. Any ideas on how to remove these set-in mud stains? Hand cleaner at the Dollar store costs one dollar. It comes in a small tub, it's like a jell type thick paste and is clear in color. It's the same thing mechanics use to put on their hands first to loosen grease then wash off. It is the best for the job. Take your item and put some hand cleaner on an old tooth brush and scrub it in good on all fabric fibers and both sides. Let set for about an hour then put it in the wash using warm water. Add some laundry detergent too. Let it agitate in the wash for about 30 minutes then wash load as usual. Add a tablespoon of it to any wash to make clothes brighter. How do I remove mud stains from a white tee shirt? Give a second wash should be gone.